If you have difficulty in finding shoes that fit comfortably and keep your feet healthy, then you might be interested in getting Propet shoes. Around the world, more people are discovering the advantages of wearing Propet walking shows which provides comfort and style while being quite durable. But what are Propet boots and shoes and why do they work so well? The Propet Walking Shoe Company was built on the foundation of creating shoes that were comfortable, offered excellent support, protected your feet, and lasted a long time under normal walking conditions. Over the years, the company has used new technology and materials to create lighter versions of their footwear while still maintaining excellent comfort and durability. You can purchase the orthopedic versions of these shoes to provide additional comfort if you have certain issues that make standard footwear inadequate for your needs. This means that if you need footwear to correct a specific issue or simply need more support for your arches, Propet offers an excellent selection where you can find what you need. There are certain benefits you can enjoy from wearing shoes and boots made by Propet, starting with those who need orthopedic or therapeutic footwear. However, even those who just want a comfortable pair of shoes can find advantages when ordering Propet. Comfort: Healthy feet come from wearing a comfortable pair of shoes and here Propet leads the pack. The shoes themselves are well cushioned while being light and breathable so that your feet remain cool and feeling good, even after walking a considerable distance. You can rely on your pair of shoes by Propet to remain comfortable for a long time. Durable: It seems with some brands that they provide comfort for a few months before falling apart and forcing you to buy a new pair. 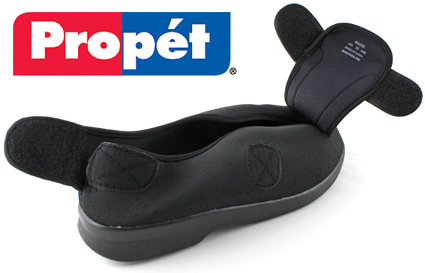 With Propet, the emphasis is on durability so that your pair of shoes will last considerably longer. For many, it’s the main reason why they choose Propet over the competition. Warranty: Propet offers a six-month or 1,000-mile outsole guarantee which means that all their shoes are designed to last a long time under normal walking conditions. Being built to last is what helps separate shoes made by Propet from the competition and provide you with a comfortable, durable shoe or boot that provides the support you want. Price: With all this extra quality, you might expect Propet footwear to be considerably more expensive than the competition. The truth is that even with the extra emphasis on quality, durability, and craftsmanship, Propet shoes are priced about the same as similar brands you find online or in retail stores. There is little doubt that Propet walking shoes are a cut above the competition when it comes to comfort, support, and durability. You can find plenty of style and comfort in Propet boots as well, providing excellent comfort while helping your feet stay pain-free. Built to last while maintaining healthy feet, Propet shoes are the ones designed for your needs all for an affordable price.